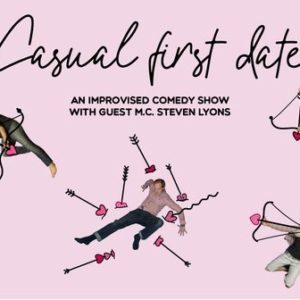 Come and see Auckland’s liveliest improv crew, Casual First Date with special guest M.C. Steven Lyons for a very special Valentine’s day show. A fresh and quirky performance plucked straight from the wild imaginations of our performers. A show where anything could happen. From morse code police recruitment, fluffy duck soap operas and outrageous revelations from vegan submarine captains, emotional support cows, star-crossed lovers and everything in between. Bring your crush, bring your lover, bring your best friend or even a first date! Or come single and you might just meet someone there.